Marginal utility theory examines the increase in satisfaction consumers gain from consuming an extra unit of a good. Utility is an idea that people get a certain level of satisfaction/happiness/utility from consuming goods and service. This utility is not constant. Often we get diminishing marginal utility. The first piece of chocolate cake gives more utility than the 7th piece. In the above example, total utility (300) is maximised after just four pieces of chocolate cake. The fifth piece of chocolate cake gives zero marginal utility, so we are indifferent between 4 pieces and five pieces. 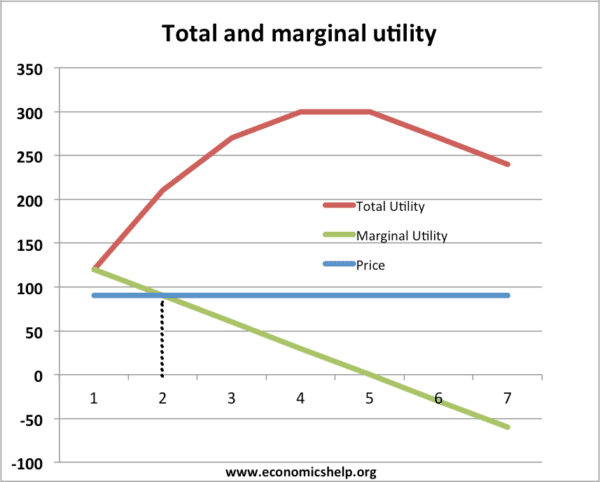 One way to measure utility is to give the utility a monetary value. In the above example, if a piece of cake cost £0.90, it would make sense to consume two pieces. 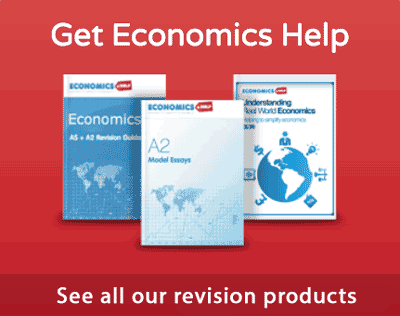 The first piece gives 120p of utility – which is greater than the price of 90p. The second piece gives a utility equal to the price. Suppose the consumption was a quantity of 40. 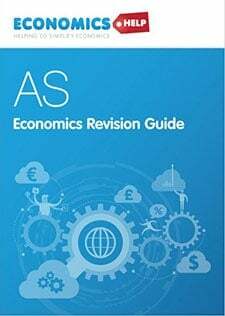 At this quantity, the price is £15, but the marginal cost is £6. 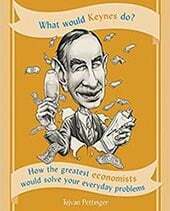 In this case, the marginal benefit (utility) is greater than the marginal cost – there is a deadweight welfare loss and underconsumption of the good. 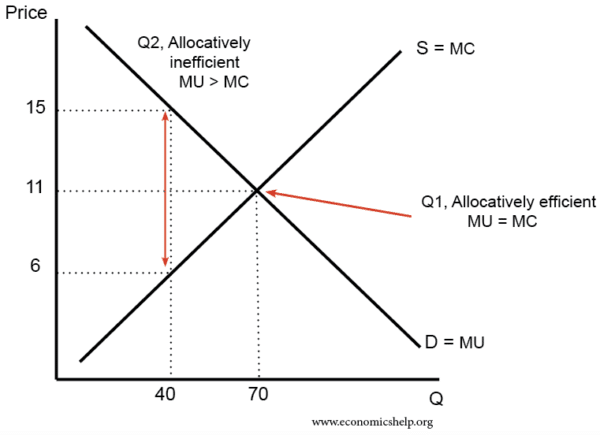 Allocative efficiency will occur at an output of 70 where MC=MY of £11. This is the excess of what a consumer would have been prepared to pay compared to what they actually pay. 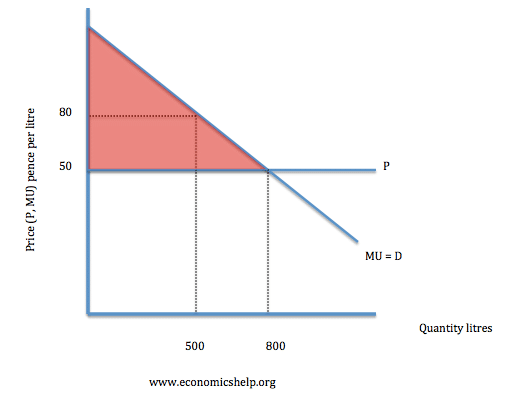 In the above diagram, at Q 500 litres, the MU is 80p > than the price = 50p. 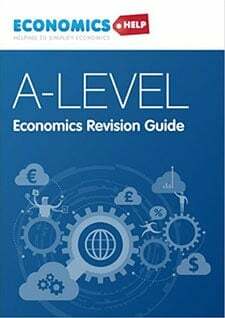 Therefore, a rational consumer will increase consumption of petrol, until the MU of petrol equals the price at 50p and a quantity of 800. For one good, the optimum level of consumption would be to consume a quantity of the good unto the point where MU = Price. There’s no point paying 75p for cake if it only gives us 50p worth of utility. Our demand curve is derived from our marginal utility. If a good gives us more satisfaction, e.g. it becomes more fashionable, our MU and demand curve will shift to the right. In the real world, we are not just deciding how much of one good to buy. We are also deciding how to choose between different combinations of goods. For example, suppose bread = £1 and Chicken = £2. Chicken is twice as expensive. Therefore, it would make sense to choose a quantity of chicken, where the marginal utility of chicken was twice the MU of bread. Therefore, you would tend to buy less chicken to make sure the marginal utility of chicken justified its higher price. 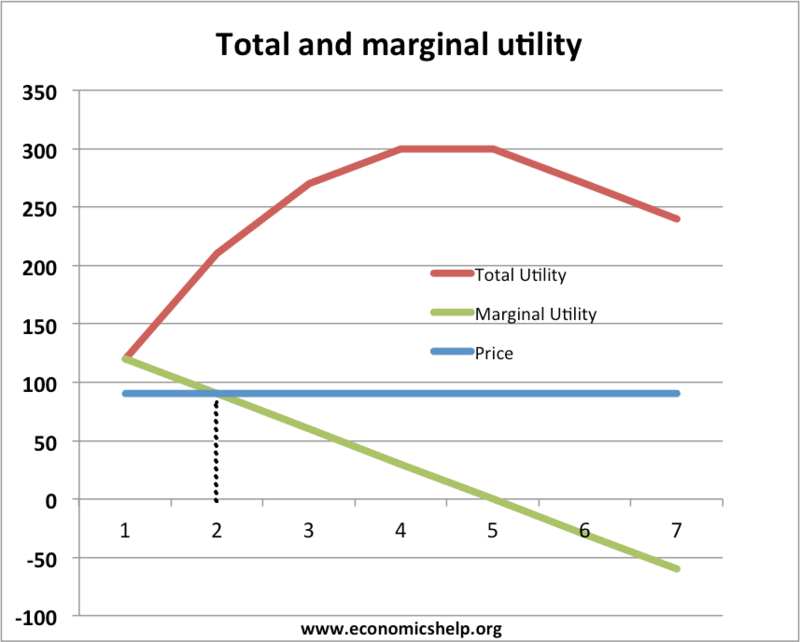 If chicken was giving three times as much marginal utility but was only twice as expensive, it would make sense to buy more chicken until the marginal utility fell to that ratio. Utilitarianism of Bentham and Mill – the accumulation of pleasure and subtraction of pain. Satisfaction of wants. 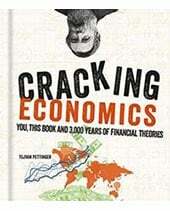 Austrian school – Von Mises also argued it was harder to quantify utility. Satisfaction of wants could be measured to some extent but after that it was difficult.